Browse our full range of titles online in the following areas: Physiotherapy, Podiatry, Sports Medicine and Orthopaedics. The study of human gait is vital to the work of podiatrists, physiotherapists, orthotists and many others, yet due to its complexity it can appear daunting to the non-expert. 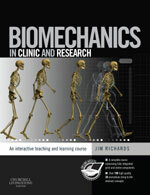 Clinical Gait Analysis takes a fresh look at the subject, founded on the author’s long experience of teaching and researching biomechanics. In the course of a comprehensive review of biomechanical principles, techniques and clinical approaches to the assessment of walking disorders, Dr Kirtley strips away the dryness and obscurity that often accompanies such surveys and provides a clear, informed and stimulating account. Both theory and practice are brought into focus, and currently contentious issues are highlighted in order to encourage critical thinking. The multiple choice questions scattered throughout the book provide the reader with the opportunity to test their knowledge of some of the more challenging sections. The essential book to refer to, whether you’re just starting out or about to go on placement or need to look up something for an assessment, the 14th edition of Tidy’s Physiotherapy is up-to-date and ready to meet the needs of today’s physiotherapy student. Chapters are written by specialists who have come from a wide range of clinical and academic backgrounds. Each chapter encourages you to problem solve and provides case studies to give the opportunity to consolidate learning and to give you confidence when you need to apply what you have learned. For the first time, a DVD ROM is included which contains sections on musculoskeletal tests, massage and exercise, and graphics which can be used for revision, presentations and even teaching.